We entered a Long position on both the Call and Put for a strangle spread on July 7th. Here is an example of how well a “strangle” position can pay off – when carrying the debit. The key is making sure you are out beyond the 30 day cycle to have a sufficient buffer. Take Away – We’ll close our position – take profits off the table and then reposition for the after hours earnings report – covering with a Short Call and Long Put for a three day hold. 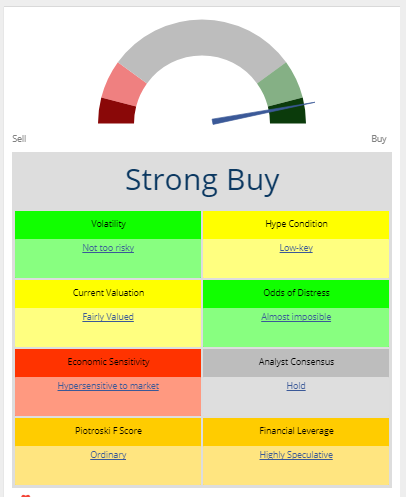 Macroaxis provides buy or sell recommendations on Netflix Inc to complement and cross-verify current analyst consensus on Netflix. 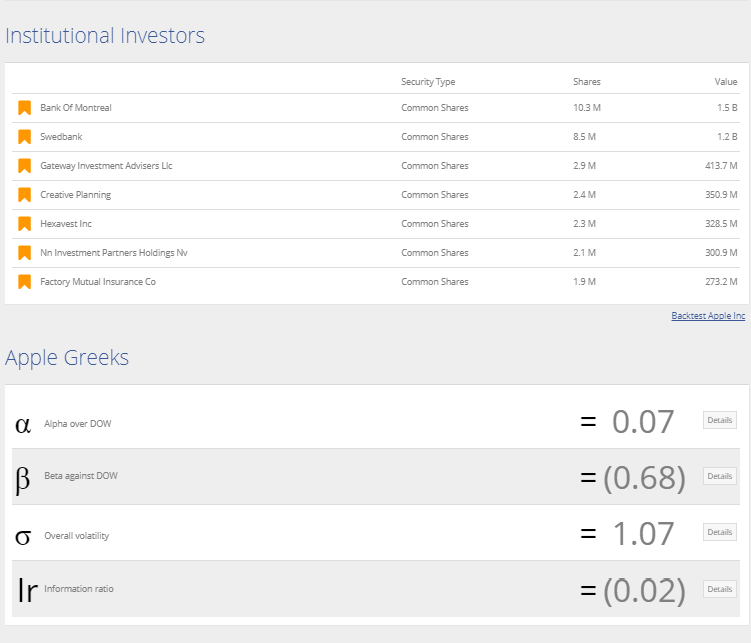 Our advice engine determines the firm potential to grow exclusively from the prospective of investors current risk tolerance and investing horizon. To make sure Netflix Inc is not overpriced, please verify all Netflix Inc fundamentals including its Current Ratio, and the relationship between EBITDA and Number of Employees . Given that Netflix Inc has Number of Shares Shorted of 27.48 M, we recommend you check Netflix market performance and probability of bankruptcy to make sure the company can sustain itself in the current economic cycle given your last-minute risk tolerance and investing horizon. If you would invest 15,340 in Netflix Inc on June 17, 2017 and sell it today you would earn a total of 772.00 from holding Netflix Inc or generate 5.03% return on investment over 30 days. 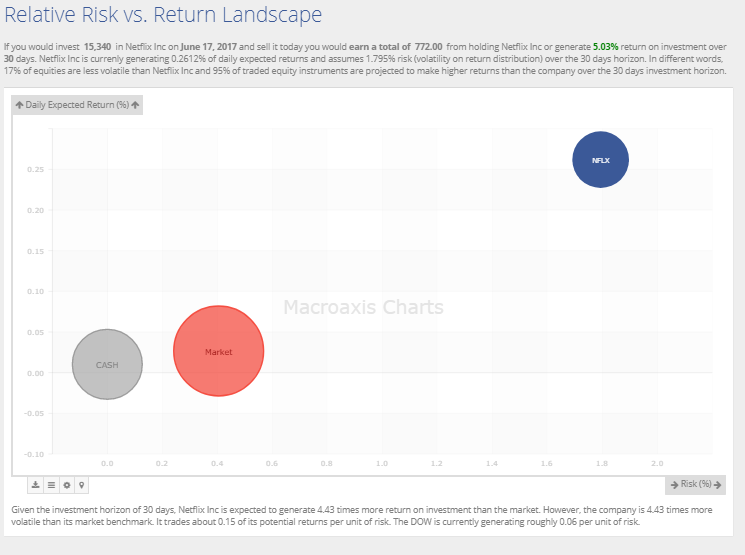 Netflix Inc is currently generating 0.2612% of daily expected returns and assumes 1.795% risk (volatility on return distribution) over the 30 days horizon. In different words, 17% of equities are less volatile than Netflix Inc and 95% of traded equity instruments are projected to make higher returns than the company over the 30 days investment horizon. On a scale of 0 to 100 Netflix holds performance score of 10. The company secures Beta (Market Risk) of 2.0468 which conveys that as market goes up, the company is expected to significantly outperform it. However, if the market returns are negative, Netflix will likely underperform.. Although it is vital to follow to Netflix Inc price patterns, it is good to be conservative about what you can actually do with the information about equity historical price patterns. The philosophy towards estimating future performance of any stock is to evaluate the business as a whole together with its past performance including all available fundamental and technical indicators. By analyzing Netflix Inc technical indicators you can presently evaluate if the expected return of 0.2612% will be sustainable into the future. 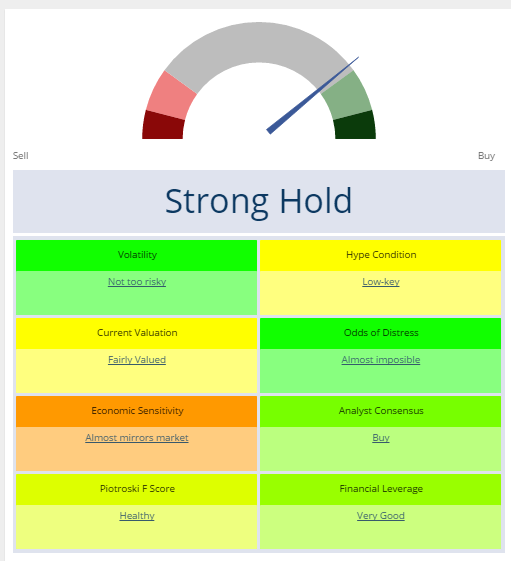 Please exercise Netflix Inc Total Risk Alpha, Downside Variance as well as the relationship between Downside Variance and Rate Of Daily Change to make a quick decision on whether Netflix Inc current price movements will revert. NFLX – The above chart shows a solid long upward trend, tapping the 78% Fibonacci Retracement. This is a signal that the equity is overbought and will pull back to the 68% at the very least- if not the 50% Fibonacci price (considered the new Pivot Price). Considering that NASDAQ will retreat at the same time. The other validation is that the Implied Volatility is over 35% – that signals leading edge on the Put side. On the TOS Chart we combine the Rate of Change with the Volatility Standard Deviation indicators – which shows a shift in our favor. 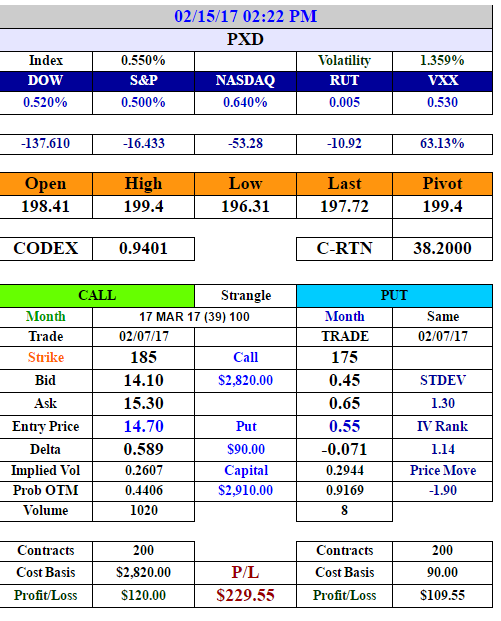 The asset Volatility is 1.03% which gives the premiums substantial vigor to move in a “swing trade” strategy. Short the Call Strike at 150 – premium decay with 1 Contract (100 shares) at our entry of $14.81 will approximately $8 in three days. The Long Put Strike at 160 – entry at $7.36 with 1 Contract ought to increase to approximately $13. With a $6 range that equals $600 we ought to see a $1200 net profit – without calculating in the option premium Bid/Ask spreads. *The column on the far right shows the Asset price range and Price Move which is more valid than the Net Change. Volume and Shares are divided to find the intraday volatility. Our DTE calibration shows the time decay factor of deterioration of the premiums and expected loss of our capital outlay. Notice that at time of Expiration the Put value is positive where the Call time value is minus. Stay Tuned: We’ll be following with NFLX in three days to determine if our quantitative model has the Proof of Concept nailed down. Request CXQ Excel Model: grtsmarket@gmail.com. 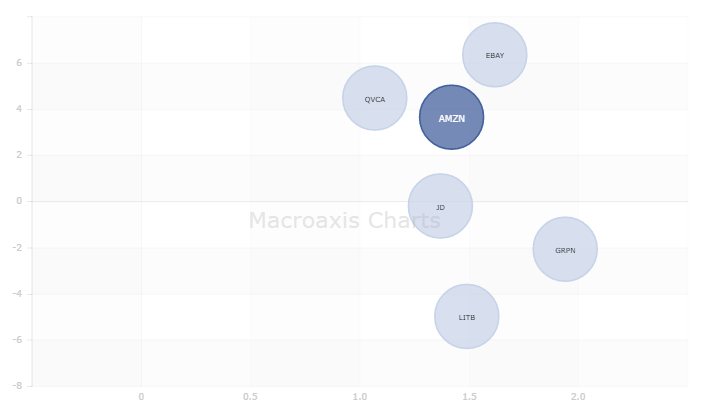 Macroaxis Research Hub and the TOS (thinkorswim) charts are attributed to the rightful owners. Duplication of the CXQ Model is strictly prohibited without attribution. Note: Entry was seven days ago – the 7-day cycle. The Put Delta has decayed substantially. The DTE Price calculations show a very strong Call position for intraday trading. Kept contracts to 1 or 100 shares. Initially entered with the AUG option chain at 44 days out. Implied Volatility below 35% so a strong Buy on the call side and Short on the put side. Volume sparse – higher Put translates into selling the Bid. To retain our profits we’ll close the Long Call and Short Put position today since it’s Friday. About DTE: Time decay is essential in knowing what the option premium will be at the time of Expiration of the option chain. We have used Edward Thorp’s formula that he devised in relationship with the Black Swan formula – though we replaced the BS with our own equation set to determine what the DTE premium will be and what profit or loss there will be with the option investment over the time (t). By incorporating the cost of the trade we have devised a means of seeing what amount will be lost in relationship with our capital outlay. In this case – the numbers show a positive outcome that confirms are choice to Short the Put and Buy the Call. Here is how it looks on our Excel spreadsheet matrix. The “Drift Price” is key to finding the asset price based on the time horizon (which we configured into another set of equations utilizing an independent and dependent linear regression combination offset by the lognormal equation. *E(S(t)) = S((0)) exp (Mt) is the expected value of the stock at time t if S(0) is the initial price. Translated: CXQ above 0.55 is a Buy signal. CXQ2 is secondary to the C-RTN to show the covariance of their “gap”. The closer the gap the more valid the signal to Buy. 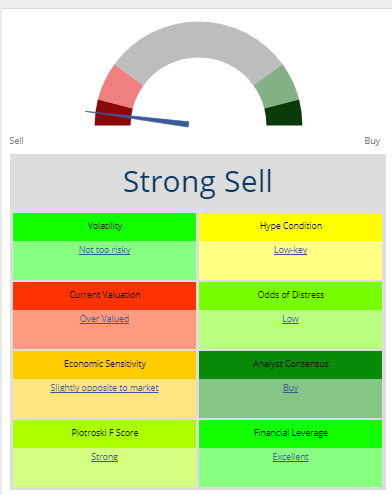 The Thorp Drift Price score confirms a strong Buy signal. Probability of Profit is based on “intraday” price moves. TAKE AWAY: Close current position to take profits off the table. Reset on Monday to Short the Option. About R. Kambak – provides input for the Macroaxis Research Hub. Anyone interested in obtaining the CXQ Excel Model please write to him: grtsmarket@gmail.com. In the Subject: CXQ Request. The TOS charts are posted with credit to the platform/brokerage. All MSN Excel spreadsheet posts are solely Mr Kambak’s own creation. Attribution-NonCommercial-NoDerivs CC BY-NC-ND Duplication is strictly prohibited without attribution. About R. Kambak – He does portfolio development for wealth building. Anyone interested in obtaining the CXQ Excel Model please write to him: grtsmarket@gmail.com. 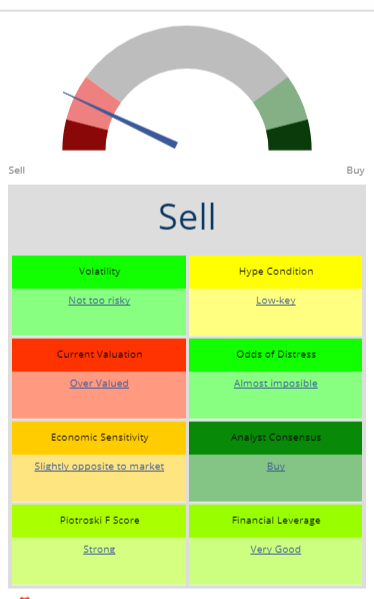 The TOS charts and Macroaxis charts are posted with credit to the platform/brokerage. All MSN Excel spreadsheet posts are solely Mr Kambak’s own creation. Duplication is strictly prohibited without attribution. I want to express gratitude to the person who was critical in a harsh response to my posting this sacred symbol in a post related to Forex trading. This graphic is one of my own modifications. Did you notice there are two separate circles with the “S” shape inside, separating the white from black, and in the center the “seed” as it is called? “What in the hell does that have to do with trading,” the irritated person remarked in a forum. Well, let’s explore this a little further, in simple terms and use a metaphor to help your mind’s resistance with another example. Correct perception of the market analytics will pay off. More likely biased thinking will not. In part, this is because, quite simply we have two parties seeking to profit from the other in an investment transaction. Understanding above all, that there is a duality in play when you are trading the market – one is seeking to dominate the other into a subordinate position so as to take the profit. The “Bid and Ask” logistics is driven by the level of net shares/orders that flow into either side, thus setting a new price that tends to project a trend, either Bullish or Bearish. Whether one trades only assets and/or combines this with options (Call and Puts) the “duality” exists over the price move. However, there is a dynamic phenomenon in play that becomes the Quantum Field. Or in another way, it reflects the “nooshpere” taken from the writings of Pierre Teilhard de Chardin from Cosmogenesis. Along with Vladimir Vernadsky (Paris, 1926) they foresaw that “..at the root of the primary definition of noosphere is a dual perception: that life on Earth is a unity constituting a whole system. One may not see a metaphysical aspect to Wall Street, yet it is quite embedded during the trading session, because it is based on human behavior (including the algorithmic machines that are programmed by humans). This “behavior” is the influence from many schools of thought, traditional to Quantum psychics. Still, the fundamentals remain: volatility and equilibrium. So, during intraday trading we have at least two parties, taking the opposite side of the “bet”, in hopes of taking the profit. During this stage, the market is not balanced, and can become more so if there is a sell off or an “All In” market. Yet, given the laws of physics, the volatility eventually creates an equilibrium between the two prices – such as a Delta equilateral outcome between a Call and Put spread when Implied Volatility drives both side’s premiums up. 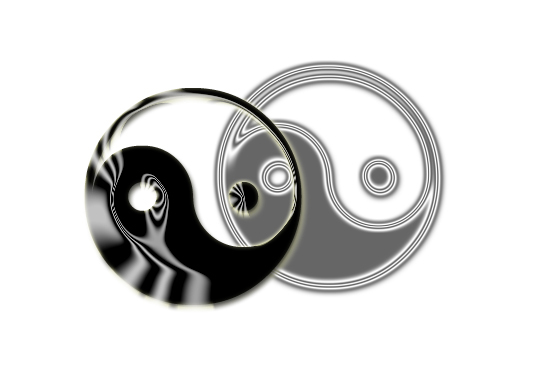 This is the juncture of Yin/Yang – the balance. Yin: represents the negative, the passive feminine principle in nature. Yang: is positive, representing the active, masculine principle in nature. Yin/Yang: presented together divides the creative fusion of the two cosmic forces; the “S”-line. Within each contain a “seed” of the other. Dichotomous judgments are perceptual, they are not real. Duality equates to “profit” when you can grasp the conceptual aspects of its empowerment in all things. Foreign Currency trading involves a dominate and subordinate currency; with respect to derivatives we consider the Put-Call Parity that exemplifies the dynamic system that two aspects empower the equilibrium of Oneness. My critic said, “That’s stupid,” signing off with the punctuation of pontifically profound pointlessness. Really? Once we reach the balance between Yin and Yang, we have entered into market’s dharma (noosphere). That translates into a trader being “in the zone” and using their intuitiveness as a natural means of analytical assessment, just as if they were making a peanut butter and jelly sandwich. It’s about “evolving” one’s self into someone they want to be: A wealth builder. Dharma has multiple interpretations and symbolic representations. For example, the ubiquitous weight scale that symbolizes “equal justice for all” (really?) or the New York City Ornamental Iron Workers logo; I can get behind that one. Then why not the Bull and Bear? Dharma conveys a conceptual scope “to hold, maintain, keep”. It is ironic that Yin and Yang merge with the dharma “that remains constant” is the equilibrium of our market exchanges striving to maintain throughout a trading session, and more over in the macro scale of global economics. The complex influx of trader’s orders, institutional orders, market maker’s price setting (there’s another story regarding that” and High Frequency Trading. The summation of Yin/Yang and Dharma brings us to the Tao; that contains 10,000 things. This surpasses the Internet of Things and only though the Quantum Frontier can realization be attained. Hmmm, is there an app for this? In conclusion; my mapping optically with symbolic meaning of our consciousness, the way we think, the duality of negative versus positive, that translates into our individual dharma, eventually leads us to the Tao: The Profit of 10,000 to the tenth power of prosperity. Be humble. And know that no one is any better anyone else. It’s just a matter of getting all the “noise” and “hype” out of the way so that you can really, really tune into what the market’s telling you – and I guarantee you, you’ll find that gem for the Universe wants you to prosper. Understanding the human dynamics makes attaining profits with effortless effort. Graphics designs are the sole property of Richard Kambak. 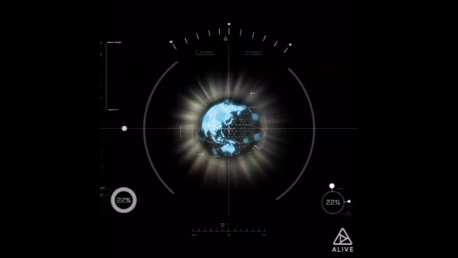 The second graphic (Earth’s Noosphere) was created by using “Alive” app (Logo appears in right lower corner). To post, attribution is required. Any contextual use that is posted on the Internet with the intent to be malicious or defamatory towards the author is strictly prohibited. INTRINSIC VALUE IS THE ACTUAL VALUE BASED ON AN UNDERLYING PERCEPTION OF ITS TRUE VALUE, BOTH TANGIBLE AND INTANGIBLE. IF BETA IS “2” IT WILL BE EXPECTED TO SIGNIFICALLY OUTPERFORM IF MARKET IS GOING UP, AND SIGNIFICANTLY UNDERPERFORM IF MARKET IS GOING DOWN. STDEV SIGNALS AN ANOMALY IF IT LOOKS LIKE AN OUTLIER TO THE TRIAD.